Replay is given over the amount you play during a day. You can use the replay to play for free the next day. So, e.g. if you won L$1000 in replay you can play for L$1000 free. This could be games of L$1, L$10 or even L$10,000. You will get the first L$1000 you play refunded. When the replay is set to 10% set, the amount of replay you win for tomorrow is 10% of the amount you play today. At the bottom of the board you see the time to go. When the time is finished, a new day start. You can use your replay in the 24 hours that follow. Don’t forget to come and use your replay. 10% is not a little. * Click the button Find in ranking to see your position on the board. * Please note the board is limited to 150 participants. The top 150 participants will get paid, the rest not. However, we have far from a 150 players a day at Devlish Dream. * The percentage is clearly displayed on the board. You might have seen the same boards elsewhere too without such display, but we think it is good to show what you can expect. * You do not earn new replay over the amounts you play and are already paid by replay. (E.g. you have L$900 replay and play two games each costing L$1000. 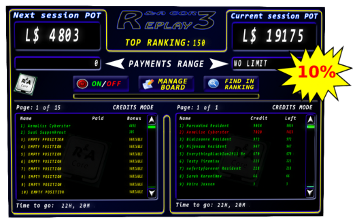 In this case you will get L$900 paid back to you as replay and you gain new replay over 2000 -/- 900 = 1100, thus your replay for the next day is 10% over 1100 = 110. The only thing you have to do to get this reward is to come back the next day and play to use your credits. The reward is a simple 10% of what you played. Don’t forget to use it and don’t play a lot if you know you can’t come the next day. Of course don’t overlook the Replay3 Cash, giving you another 5%.